This the final December that Cook the Book Fridays will be cooking from David Lebovitz’s My Paris Kitchen. That makes it a no-brainer that the holiday challenge this year must be the Christmas Cake aka Bûche de Noël. Honestly, I can’t say that this cake was ever on my kitchen bucket list. 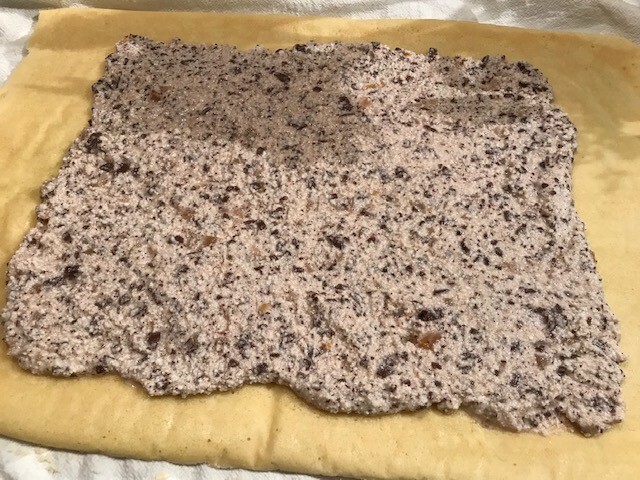 This time of year, I see them pictured in food magazines, Pinterest, and on the internet, but I’ve never been tempted to try a bite, much less try my hand at making one. However, I offered to bring dessert this cake for Christmas Eve where there would be many more taste testers than in my house. On first glance, the recipe is rather intimidating. There are many components required. However, a closer read shows that none of the steps are actually complicated. Let’s start with the cake. This is a thin eggy genoise baked on a half sheet pan. I wanted to make a smaller cake, but I was limited by the pans available. So, I made the full cake, intending to just use half. The batter came together easily in the stand mixer. I used an “X” of soft butter to adhere parchment to the pan. I think I should have also smeared butter along the edges of the pan too because when the cake baked, the edges curled up. While the cake is still warm, you roll it up to cool (so it will remember the shape without stiffening). 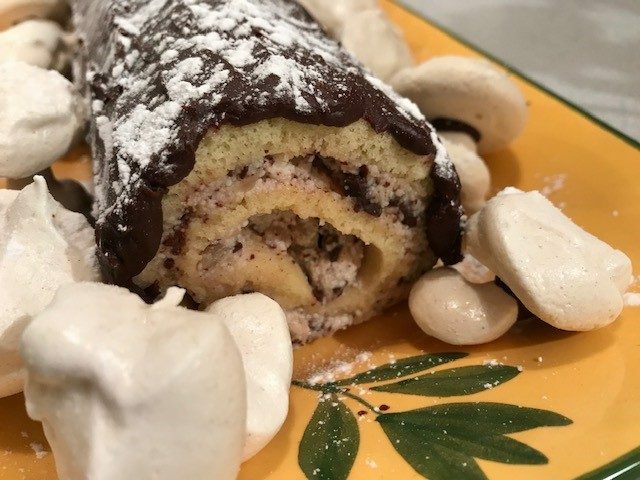 In the meantime, a filling reminiscent of cannoli filling is mixed up: ricotta cheese, candied orange peel, finely chopped chocolate and a touch of sugar. You also need to make a light orange syrup. After an hour, unroll the cake and liberally brush it with syrup and then spread the filling evenly over the cake. I only made half the filling and it generously covered about two-thirds of the cake. Now, you roll it back up into a log. At this point, I trimmed off the ends at the point where there wasn’t any filling. I wrapped the log in plastic and let it chill in the fridge overnight. The next day, I made a simple ganache, adding a little instant espresso powder (I don’t make coffee at home) and frosted the cake. Because I made the cake smaller, I didn’t create any branches. It looked quite “log-like”. I stashed the cake bake in the fridge to wait for dinnertime. Whenever I see pictures of bûche de Noël, it’s the adorable mushrooms that sometimes catch my eye. 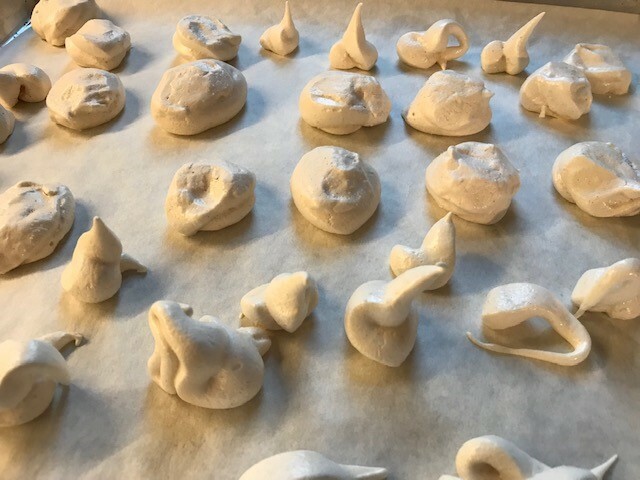 I whipped up egg whites with sugar and cinnamon to make a meringue. Then, I piped the meringue into mushroom caps and stems. I might not have whipped the egg whites quite stiff enough because my stems weren’t very pointy. After a long low bake, once the meringue cooled, I melted some chocolate and started to assemble mushrooms. I carved a little hole under the cap, dipped a pointy stem into chocolate and glued them together. Most of my mushrooms were rather top-heavy and didn’t stand up on their own. However, it was easy enough to lay them around the log on the platter where no one was the wiser. The bûche de Noël is an impressive holiday dessert! Our friends, whose family is Swiss, announced that this version was not “the real way”. They said bûche de Noël should be filled with chocolate mousse (and maybe that the cake should be chocolate). I’m not sure that’s true as an Internet search didn’t turn up any rules. I’ll admit that for Howard and me, it wasn’t our favorite sort of a dessert, but it was fun. My favorite part was the mushrooms. I snacked on the reject pieces for days. The hint of cinnamon was lovely. If you want to try out this version, you can find the recipe on page 319 of David Lebovitz’s My Paris Kitchen. To see how the other home cooks from Cook the Book Fridays made out, check out their links here. 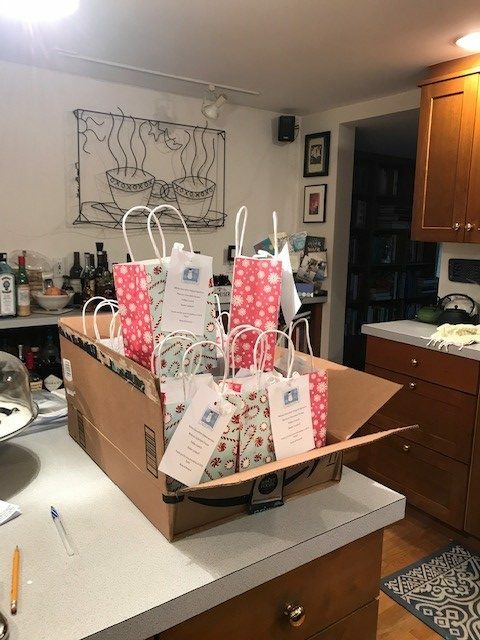 In addition to a Yule log, I had a blast making packages of sweets for my local friends. 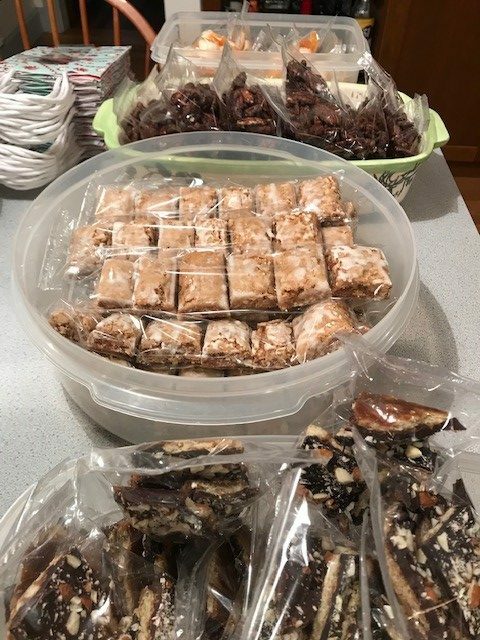 This year, I made white-chocolate dipped apricots (a perennial favorite), Mexican Chocolate Pecans (inspired by our recent trip to Mexico), Toffee Crunch (you know, the old standby with the saltines covered in toffee, chocolate and nuts), and another favorite Basler Leckerli. I also sent homemade peppermint bark and miniature Chocolate Meltaway Cookies (newly named by my sister Jennifer) to my sisters. Next week, healthier eating awaits…. Wishing you a Happy (and Delicious) New Year!!!! I have mixed feelings about French desserts. Tarts I adore, but I’m indifferent to many of the pastries. Maybe it’s because I’m not a big fan of pastry cream and whipped cream. There are plenty of French sweets I’d never met before. Over the past couple of years, making more French recipes, I’ve started to have a new appreciation for little French cakes. The past two challenges for Cook the Book Fridays have been for little cakes. Both are rich from butter, but in counterpoint, are not too sweet. The first one, financiers, are little almond cakes with browned butter. They taste nutty from almond flour and the browned butter. 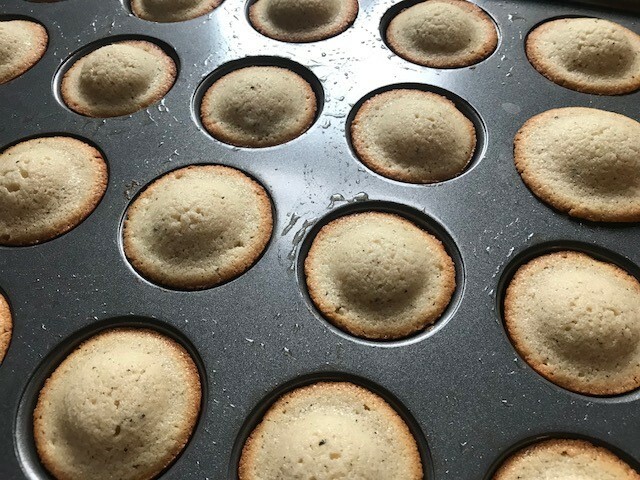 The French have a special mold for baking these, but I used mini-muffin pans. These baby cakes are simple to mix up and are a good way to use up extra egg whites. And they taste good too! 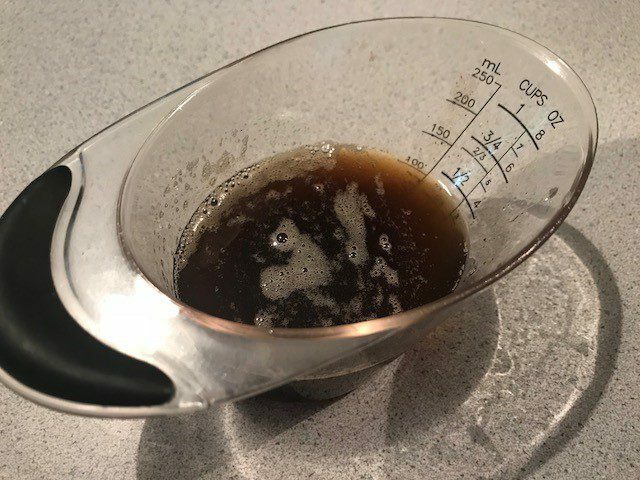 Is my browned butter too brown? The other little cakes I made were madeleines. The batter is also simple to make, but these require a special pan. I had more trouble with these. In the past, I’ve chilled the batter, but this time, the recipe just said to let it rest (at room temperature, I assumed). The molds are supposed to be filled just three-quarters. The imprints are so shallow, it’s hard to judge. I used my smallest cookie scoop, but it was a bit too much. The cakes rose and touched their neighbors. Not the way it’s supposed to work. There was some extra batter, so I chilled it overnight, and tried again. Round 2, I was more careful about filling the molds, erring on the side of underfilled. That worked much better, though my pan-buttering technique had some shortcomings. The cakes stayed inside the expected boundaries, but most of them stuck to the pan. When they finally came out, they were NOT pretty. I had brushed the mold with melted butter, but I think I should have smeared it around with a paper towel for better coverage. Even though their appearance was lacking, these baby cakes tasted lovely. I liked the subtle flavor of honey – just a touch, not cloying at all. 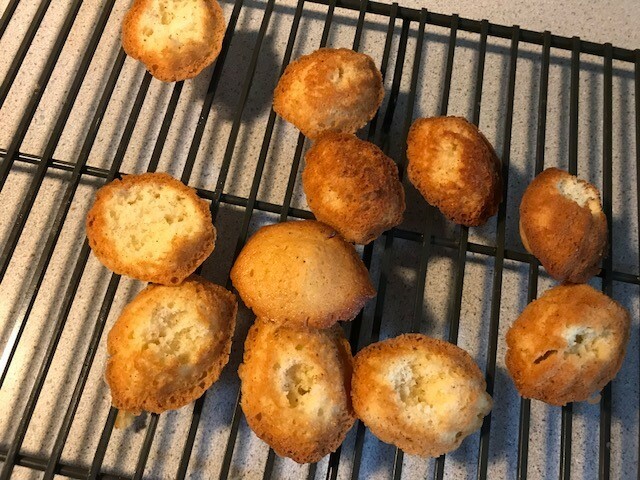 I’d be confident in whipping up some financiers any time, but the madeleines will need more practice. 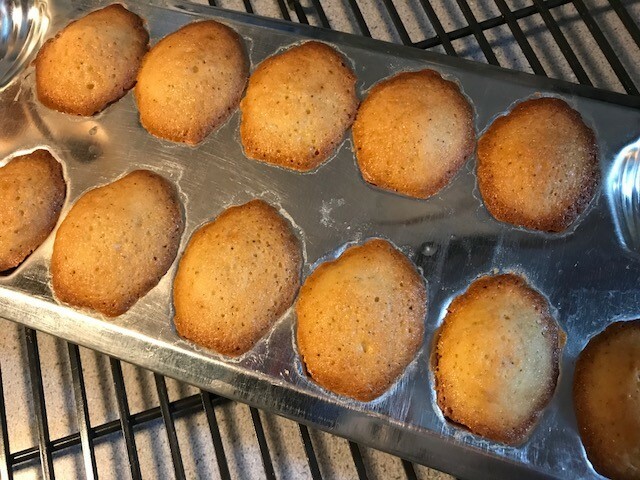 If you want to try yourself, you’ll find the recipe for financiers on page 268 of David Lebovitz’s My Paris Kitchen and the recipe for madeleines on page 274. 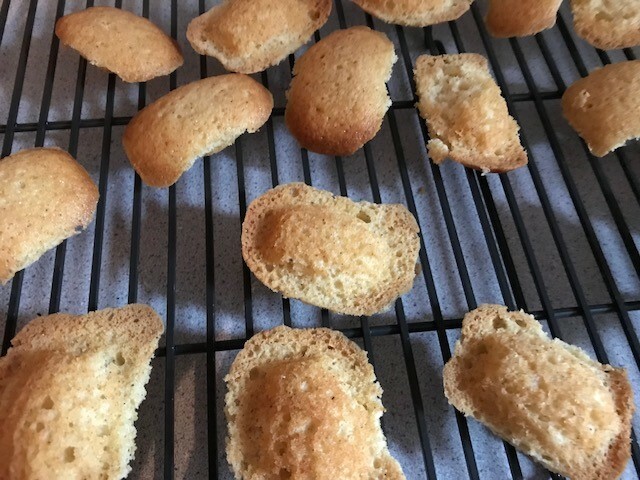 My friends’ reviews for financiers can be found here and for madeleines here. Boston people: I have something you must check out this month. 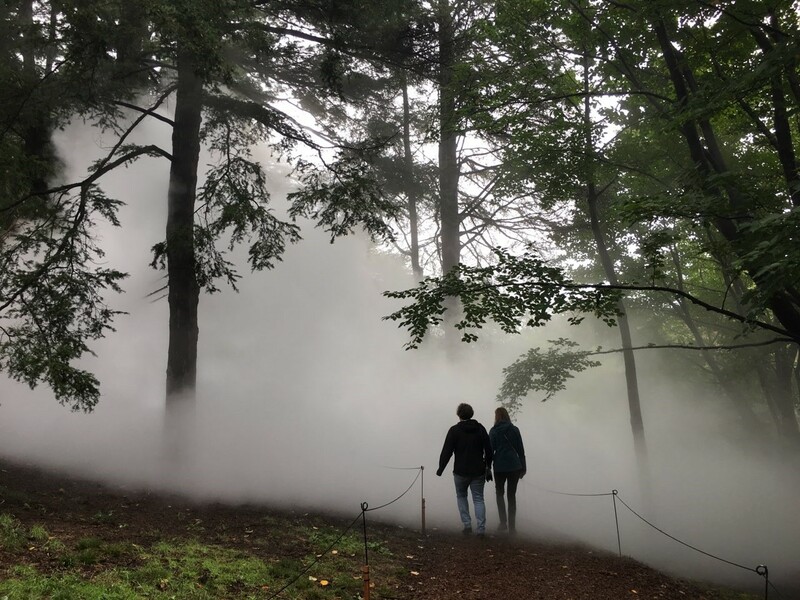 Last week I went with some friends to check out some of Fujiko Nakaya’s fog sculptures on the Emerald Necklace. At 5 different locations, special misting nozzles create fog that rolls through the landscape. It’s hard to describe, but it’s quite magical. Fog x FLO is a special exhibit in honor of the Emerald Necklace Conservancy’s 20th anniversary. It runs through the end of October. Find all the details here.